Cheesecake and I are best buds. We go far in the history. You see, cheesecake was the first dessert I made by myself. All the way from mixing to cutting and serving. I was so impressed with myself, that I made it a first dessert for my then-future-Hubby. We had many of them since then. I have my secret recipe that always comes out perfect! This is just the first one I am sharing on CCS. It’s a no-bake style, easy to put together and very adaptable to your flavor likings. It’s not too rich or overly sweet as many cheesecakes can be. It’s creamy texture leaves you satisfied. I added the chocolate shavings just for the fun of it. Because you can never go wrong with a little bit of chocolate. 🙂 I love the speckled look they gave this dessert. Ok, now I will reveal one of my secrets to you. It’s life-changing so you have to focus. I made the crust from cereal. Yep! You read it right! Instead of using the standard graham crackers, I used Cheerios! It was one of these days when I wanted to make cheesecake but I didn’t have graham crackers. Or any cookies for that matter. That’s when I saw the box of my kid’s favorite cereal, waving at me! So next time you want to make a crust, use cereal! They make for a very crispy crunchy crust. Yum! So now you know why this dessert is so amazing! Creamy cheesecake filling sitting gracefully on top of crunchy cereal crust. They compliment each other so well! Yes, cheesecake and I are best buds. Preheat your oven to 375 degrees. Crush the Cheerios in a food processor. ( You can also put them in a zip lock bag and smash with a rolling pin. ) Place the crushed cereal into a 8″ round cake pan. Pour the melted butter on top and sprinkle the sugar. Mix all with a fork or by hand. Make sure the cereal are moistened with butter really well. Spread it all over the bottom of the pan and pat well. Try to get some up the sides too. Bake for 10 minutes. Cool completely before adding the filling. In a large mixing bowl, beat cream cheese for 3 minutes. Add sugar and beat until fluffy. Add vanilla and sour cream and beat again. Gently fold in the whipped cream and chocolate shavings. Refrigerate until set, at least 2 hours. ( If you are pressed for time or simply can’t wait to dig in, place the cheesecake in the freezer and check every 30 minutes if it’s set. ). Do you have a dish that you are sentimental about? Cherios for the crust, no way! This sounds so good, I love cherios…gives the crust a nice crunch, but different from the typical graham cracker. 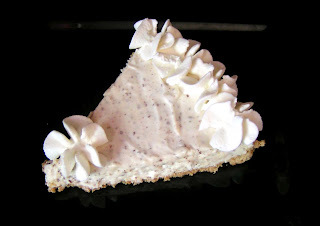 I love the grated chocolate in the cheesecake filling – sounds so good! Yay! I am so happy you like the idea 🙂 Let me know how it turns out! Thank you, Jocelyn! u didn't use any gelatine. can it set without gelatine? If i dnt want to use the sour cream, what can i replace it with? Yes, it will set without the gelatine. Check every half an hour or so. If you don't want to use sour cream, you can easily substitute yogurt for it. I added it for the extra creaminess. Thank you! The cheerio crust is brilliant. I love hearing about substitutions that work out well. Your cheesecake sounds lovely. this looks great, awesome flavors! and i love that it is no-bake! This no-bake cheesecake looks amazing. I love the combo of flavors you used. Even better, it's no bake. Gotta love that. Cereal crust, chocolate, and cheese…what a fabulous combination! And it looks very pretty too. great idea w/ the cheerios =)) Hi Anna, this is so pretty and sounds delicious. 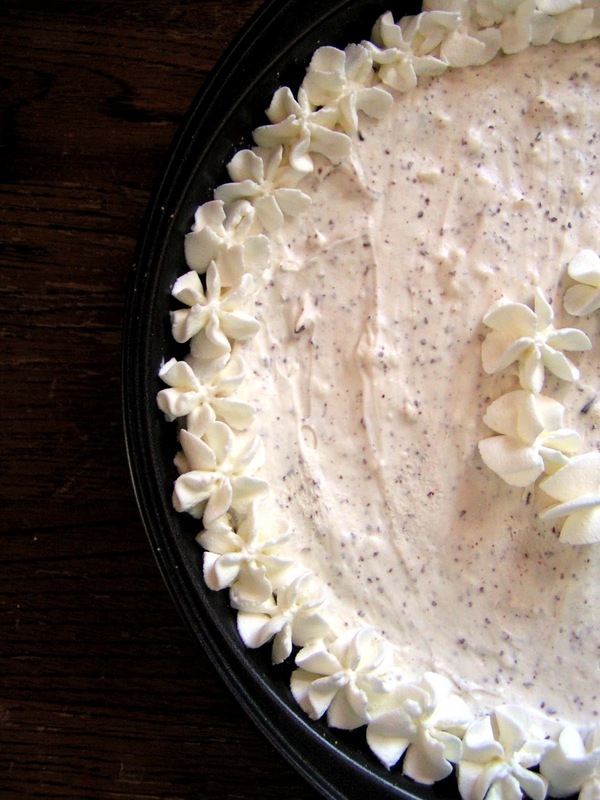 What did you use to decorate the cheesecake with? (it looks yummy too) Hope you have a great evening!!! Yay for cheesecakes! 🙂 Thank you, Anita! This is a gorgeous as I know it is delicious!!! And your garnishing is pure perfection! Must try cereal crust! Yummy! I really went crazy for it! Lol 🙂 Thank you, Dorothy! This looks so good! It's been awhile since I last had any cheesecakes! Your cheesecake is exquisite! The specckling affect looks beautiful! Obviously cheesecake is the way to a man's heart!! 🙂 Great idea to use cheerios for the base…I wonder what it would taste like with honey nut cheerios? Right? So many cereal kinds, so many crust possibilities! Thank you, Laura! Cheerios for a crust? Never thought of that, but an absolute brilliant idea and fantastic shortcut. I too love cheesecake, as for a food I am sentimental about I think it would have to be apple pie. It was the first “complicated” dessert I made for one of my college boyfriends (we aren't together anymore though). It was wonderful to go from start to finish with it and I think it tasted that much better because I had to do all of the work. I agree. It feels great to create something delicious from scratch. Although my pie crusts do need some improvement. Thank you, Rachel! My favorite cheesecake crust came out of one of my cooking classes where we didn't have enough graham crackers – I threw together some Ritz crackers, walnuts, cinnamon, sugar and the little bit of graham crackers. It was amazing, and now I use it every time! Oh, that sounds amazing, Jen! I will have to remember this. Thank you so much! I never would have thought to put Cheerios in the crust–that's inspired! This cheesecake looks wonderful, creamy and (thankfully) not too sweet. Now that is how to make use of ingredients on hand. 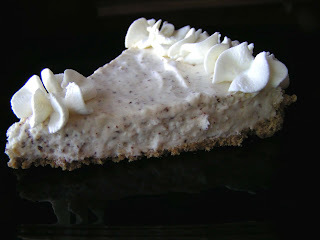 I would have never thought about a cereal crust, but it does so well with milk, why not cheesecake! Also, I love that it has the chocolate speckles, not overpowering but just the right amount. This is an example of why you are listed with Very Good Recipes-delicious creation! I love no bake recipes like this one! Such a keeper! Oh my! lol Should I be including warnings with my recipes from now? 🙂 Thank you, Richard!